Is your roof leaking? Maybe some shingles or flashing have blown off? Perhaps the damage is more severe such as sagging in your roof or damage from a fallen branch or tree? Whatever the need, the roof repair experts at True Pro Quality Roofing, Inc. can help. Many roofing companies will only offer an option for a new roof. Many times a roof can be repaired rather than replaced. Leaks can result from flashings that have come loose or a section of the roof system being damaged. A complete roof system failure, however, generally is irreversible and a result of improper installation, choice of materials, or the roof system installation is inappropriate for the home. Our experienced and trained estimators will responsibly assess your roof condition and offer an appropriate solution to your problems. Including age, there are many reasons why you would need to have your roof repaired. Improper workmanship, weather conditioning, and unexpected disaster are just a few. Below you will find summaries of each cause and their effect on a roofing system. As a homeowner, you should also know that a repair left undone could make the problem much worse and if you have a roof repair that needs attention it should be completed as soon as possible. According to experts, approximately 90% of all roof leaks are due to improper installation. Many homeowners are surprised to learn that many roof leaks are not obvious. They can develop over time before the damage is obvious to the naked eye. Slow leaks that go undetected for long periods of time can cause the harmful growth of mold, structural damage and in the most severe cases, complete collapsing of the roof. Improperly installed roofs are more common than homeowners think. This is why they should only be installed by skilled tradesmen who are proficient in the residential roof repair and installation industry. One of the most common problems with improper workmanship is shingle installation. 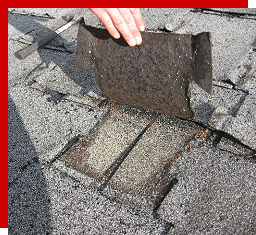 Improper shingle installation can be as simple as shingles that are not fastened correctly. Improperly installed shingles can lead to larger, more expensive repairs like those caused by water damage and foundation erosion. Our roofing installers are experts in the roof repair/installation field and True Pro Quality Roofing, Inc. has been providing roofing services to the Dallas, Fort Worth area for over 25 years. True Pro Quality Roofing, Inc. is also in excellent standing with Better Business Bureau and a member of Roofing Contractors Association of Texas. You can count on True Pro Quality Roofing, Inc. to get the job done, right the first time! Roofs are exposed to the elements all day, every day. Over time, the materials it is made from becomes damaged from excessive heat, cold, rain, wind, ice, snow and various types of debris. Clogged gutters, missing shingles and slow leaks can all happen as a result of this breakdown in your roof. Regular maintenance and routine roof inspections can catch minor problems before they become big, expensive ones. The problems listed above are just a few of the issues that make roof repair necessary. Others include improperly designed roofs, leaking skylights, and the use of faulty material during construction. Our professional roofing technicians at True Pro Quality Roofing, Inc. are fully knowledgeable about all of the causes that make roof repair necessary. Your roof is an important part of your home’s value. Our professionals will help you protect your investment. Please call True Pro Quality Roofing, Inc. today at 214-491-1830, to help determine if your roof is in need of repairs. We will be glad to provide you with a free quote after our experts do an on-site roofing evaluation.